Now, this may seem a bit excessive to quite a lot of people, however, according to the company the two additional cameras give in for better-optimized photos. 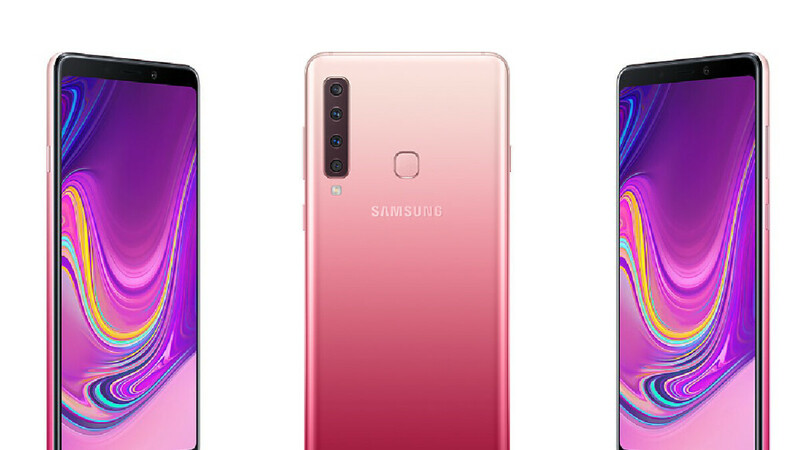 And Samsung certainly isn’t shying to boast galaxy A9 as “Instagram Optimized” smartphone and we can very well predict where the company is aiming the smartphone. Now, although the quad rear camera system absorbs much of the attention, Galaxy A9 contains some other impressive features as well. The smartphone boasts a 6.3-inch full HD+ Super AMOLED display and is powered by 6GB strong RAM and a 3,800 mAh battery. The Galaxy “A” series is Samsung’s mid-range line-up that is certainly optimized to compete with affordable flagship devices from other Chinese manufacturers and the Galaxy A9 with 4 cameras certainly sits atop of the series and in direct competition with flagship devices like OnePlus 6, Honor 10 and other “affordable mid-ranged flagship devices” from various other chinse manufacturers. At the moment there is no confirmed release date for the device, however, we expect to see in markets by Mid-November. To be honest, the Galaxy A9 price seems just a little below their flagship “S” series devices. What we know at present is that the A9 will hit the market with a price tag of around USD 720, which means it will be more expensive than other affordable flagship devices from Chinese manufacturers, and cheaper than Samsung’s own “Flagship S series”. Let’s just simply say that Samsung left no stone unturned in giving A9 an exquisite and upbeat feel. The premium metal frame with glass front and rear make sure that the device looks apart in hands. The device will be available in 3 enchanting colors with lemonade blue being the most charismatic. Other color options include bubblegum pink and a rather low beat caviar black. Going with the market flow, the devices are finished with attractive two-tone finishes; something that is fast becoming the new normal in many devices. The device boasts a 6.3 inch Super AMOLED Full HD+ display with dimensions measuring 162.5 x 77 x 7.8mm. To give you an idea, the device will be a bit taller and wider as compared to Galaxy Note 9. One particular limitation that we felt strongly was the lack of grip. The glass rear gives it a more precarious feel to grip and you would definitely like to have a casing to have the peace of mind. The fingerprint sensor is nicely placed at the middle of the rear and falls within easy reach of forefingers. The other utility keys are present at each side of the frame. Another impressive functionality included in the device is the smart voice assistant. You could easily activate it by pressing a physical button present on the left side of the device. Now, although this might not be as attractive to many people out there, nonetheless, the presence of a top-tier technology function in a non-flagship device certainly speaks volume of Samsung’s approach to the future. Lastly, we certainly feel great to see the presence of headphone jack in the device (some good news for audiophiles like us). Now, the presence of 4 rear camera system and the company’s claim for “Instagram optimized photos” clearly reveal the main target market for the device as well as the main attraction. To go in a bit detail, the primary camera on offering here is 24MP and is available in default mood. This camera is also the one that will give you best results in low light environments. The next-in-line is an 8MP wide-angle lens that is aimed to increase the details in images. This is followed by a 5MP depth-sensing camera that’s used to add depth, focus, and blur. Lastly, there’s this 10MP camera with a telephoto lens that’s meant to give 2x optical zoom so you can get closer to the action. Now, to be honest, we have been achieving all of these different functions one way or the other through software, however, as per the company statement, a shift to hardware will produce crisp and sharper results. And lest we forget, there’s a 24MP front-facing camera as well. This USD 720 device doesn’t come slow on performance and packs an octa-core Exynos 7885 chipset with a 6GB RAM for fair enough power. The only lacking here might be the older Android version used by the device, however, sources in Samsung says they will be updating that to latest Android Pie ASAP. Other than that, the Galaxy A9 comes with a large 128GB built-in storage, which can be increased to 512GB via MicroSD card. The Galaxy A9 comes with a strong 3,800mAh battery, which interestingly is even greater than what we have seen in Flagship S9 and S9 Plus. Unfortunately, Samsung decided to not offer wireless charging option for A9, however, it does boast a fast charging capability. The 4 camera Samsung Galaxy A9 is surely a hot sensation in the market that’s not only powerful to compete with the likes of various mid-range flagship devices from other manufacturers but also comes with a premium feel and material. Although we still don’t know how far distinguished the 4 cameras will deliver, nonetheless, it is definitely a worthy smartphone at a decent price.